While their motivations vary, businesses of all sizes, industries, and geographies are turning to cloud services. According to Goldman Sachs, spending on cloud computing infrastructure and platforms will grow at a 30% compound annual growth rate (CAGR) from 2013 through 2018 compared with 5 percent growth for overall enterprise IT. Cloud adoption is accelerating faster than previously anticipated, leading Forrester to recently revise its 2011 forecast of the public cloud market size upward by 20 percent. Whether you’re looking atSoftware-as-a-Service (SaaS), Infrastructure-as-a-Service (IaaS), or Platform-as-a-Service (PaaS), the predictions are the same: fast growth of the workloads placed in the cloud and an increased percentage of the total IT budget going toward cloud computing. According to a study by the Cloud Security Alliance, 33% of organizations have a “full steam ahead” attitude toward cloud services and 86% of companies spend at least part of their IT budget on cloud services. IT leaders at 79% of companies receive regular requests from end users each month to buy more cloud applications with file sharing and collaboration, communication, social media, and content sharing topping the list of the most-requested cloud services. Numerous factors are driving cloud adoption, according to a study conducted by the market research company Vanson Bourne. “The Business Impact of the Cloud” report compiles insights from interviews of 460 senior decision-makers within the finance functions of various enterprises. The report summarized 11 drivers of cloud adoption along with quantifiable improvements these companies have achieved by deploying cloud services to improve productivity, lower cost, and improve time to market. Though they aren’t in IT positions, the majority of these financial executives are actively involved in their organizations’ discussions about cloud strategy. Their perspective of cloud computing includes benefits to the business as a whole. 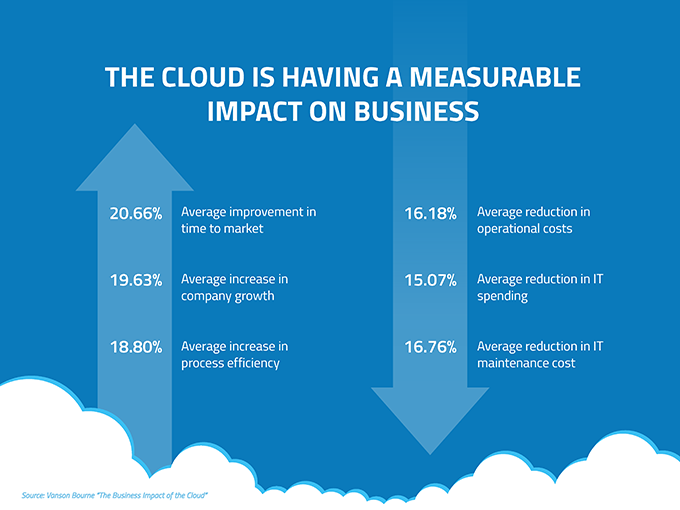 Companies that adopted cloud services experienced a 20.66% average improvement in time to market, 18.80% average increase in process efficiency, and 15.07% reduction in IT spending. Together, these benefits led to a 19.63% increase in company growth. With SaaS, the latest versions of the applications needed to run the business are made available to all customers as soon as they’re released. Immediate upgrades put new features and functionality into workers’ hands to make them more productive. What’s more, software enhancements are typically released quite frequently. This is in contrast to home grown or purchased software that might have major new releases only once a year or so and take significant time to roll out. The costs of cloud computing are much more flexible than traditional methods. Companies only need to commission – and thus only pay for – server and infrastructure capacity as and when it is needed. More capacity can be provisioned for peak times and then de-provisioned when no longer needed. Traditional computing requires buying capacity sufficient for peak times and allowing it to sit idle the rest of the time. Most cloud providers are extremely reliable in providing their services, with many maintaining 99.99% uptime. The connection is always on and as long as workers have an Internet connection, they can get to the applications they need from practically anywhere. Some applications even work off-line. Data and applications are available to employees no matter where they are in the world. Workers can take their work anywhere via smart phones and tablets—roaming through a retail store to check customers out, visiting customers in their homes or offices, working in the field or at a plant, etc. Cloud applications improve collaboration by allowing dispersed groups of people to meet virtually and easily share information in real time and via shared storage. This capability can reduce time-to-market and improve product development and customer service. Because companies don’t have to purchase equipment and build out and operate a data center, they don’t have to spend significant money on hardware, facilities, utilities and other aspects of operations. With traditional computing, a company can spend millions before it gets any value from its investment in the data center. During times of recession or business cut-backs (like the energy industry is currently experiencing), cloud computing offers a flexible cost structure, thereby limiting exposure. Cloud is the flexible facility that can be turned up, down or off depending upon circumstances. For example, a sales promotion might be wildly popular, and capacity can be added quickly to avoid crashing servers and losing sales. When the sale is over, capacity can shrink to reduce costs. Cloud computing accommodates faster changes so that two companies can become one much faster and more efficiently. Traditional computing might require years of migrating applications and decommissioning data centers before two companies are running on the same IT stack. With fewer data centers worldwide and more efficient operations, we are collectively having less of an impact on the environment. Companies who use shared resources improve their ‘green’ credentials. Despite these benefits, the Cloud Security Alliance has identified several barriers holding back cloud adoption. At 73% of companies, the security of data is the top concern holding back cloud projects. That’s followed by concern about regulatory compliance (38%), loss of control over IT services (38%), and knowledge and experience of both IT and business managers (34%). As organizations address their security and compliance concerns by extending corporate policies to data in the cloud and invest in closing the cloud skills gap, they can more fully take advantage of the benefits of cloud services. CAMERON COLES: Sr. Product Marketing Manager at Skyhigh. 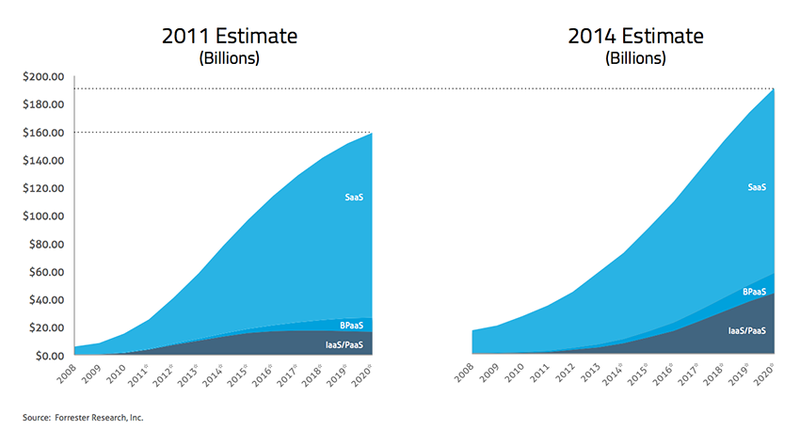 Interested in data that reveals the promise and peril of the cloud economy.